CREST Builder Holdings Bhd has received a letter of intent from Lembaga Getah Malaysia (MRB) via its 51% subsidiary, Landasan Bayu Sdn Bhd, for a proposed joint-venture development of the 4.8-acre MRB site in Ampang. Landasan Bayu is a joint venture (JV) between Crest Builder and its partner, Tindakan Juara Sdn Bhd. The proposed JV involves Landasan Bayu as the developer while MRB is the landowner. MRB will get RM299.9mil, which will be settled by a combination of cash and completed units. We think the structure is similar to the Dang Wangi redevelopment project, which is 60% paid in kind and 40% in cash. The cash portion will likely be paid progressively over the project life. The land to gross development value (GDV) ratio is slightly lower at 17% versus the Dang Wangi project at 21%. This means margins should be better, if not similar to Dang Wangi's 20% pre-tax margin. We also believe that the group will undertake the construction of the project, implying a two-pronged revenue stream. The project will be a mixed development with a GDV of RM1.33bil. Based on the guided gross floor area of 1.65 million sq ft, with the assumption of an utilisation rate of 70%, we derive an average selling price of RM1,150 per sq ft.
We understand the project will span five to six years and will start work in late-2013, with the launch likely to be in 2014, so the future pricing appears to be fair as neighbouring MSuites was launched at an average selling price of RM1,000 per sq ft last year. We are overall positive on the project, as the group is moving towards catalytic property development projects, which will re-rate the stock from a contractor to a developer. We expect a firm agreement to be inked in the next few months.There are no changes to our financial year ending Dec 31, 2012 (FY12) till FY13 estimate pending a firm agreement. Either way, earnings contributions will only be significant towards end-FY14 estimates. 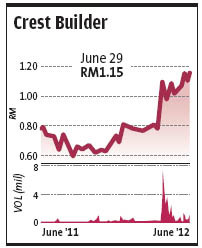 We maintain our “outperform” call on Crest Builder with a target price of RM1.49. Crest Builder is at its inflection point with re-rating catalysts as it moves from its traditional construction business into the property development scene while riding on the ETP play with Dang Wangi and MRB. Risks for the company include capital management risks as well as property and construction sector risks, including negative policies and slow contract awards.